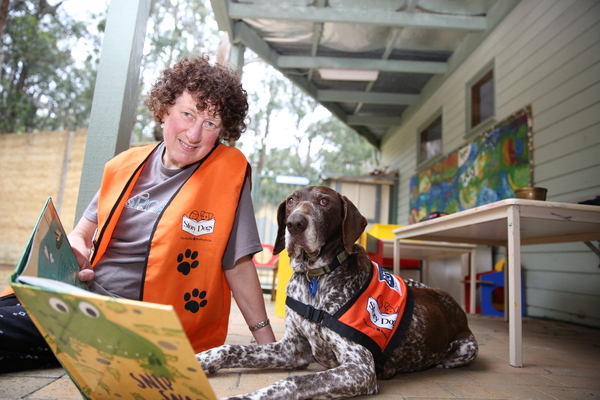 German Short-haired Pointer, Lucy and her owner Valerie Sayce joined the in-school literacy charity, Story Dogs almost two years ago and have since been helping students at Menzies Creek Primary learn to read. The latest teaching aid to help Menzies Creek Primary students improve their literacy skills has arrived and she has four legs, a tail and a furry coat. German short-haired pointer Lucy and her owner Valerie Sayce joined the in-school literacy charity, Story Dogs almost two years ago and has since been helping students learn to read. The organisation is based around the idea that when children read to a dog it provides a non-judgmental setting where the children’s focus improves, their literacy skills increase and their confidence soars. Ms Sayce said the program was a great way of making reading fun, especially for children who might be daunted by having to read in front of others. “As someone who has always enjoyed books and dogs, to put them together is fantastic,” Ms Sayce said. 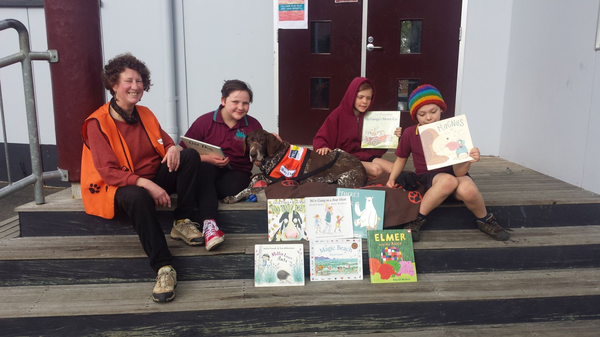 Once a week, Ms Sayce and Lucy visit Menzies Creek Primary where students read to Lucy for 20 minutes at a time. The accepting, loving nature of dogs gives this program its magic and helps children relax, open up, try harder and have fun while reading to a friendly, calm dog. Ms Sayce said the best part of the program was that it benefited all involved and added that Lucy loves the attention she receives from the children. “They can choose a book, sit down and they read the book to Lucy,” Ms Sayce said. Of course students are also able to pat and cuddle Lucy which reduces the stress of reading.